I was only in Moscow for two full days so my experiences in the Russian capital are limited to the tourist stuff. We visited the Kremlin on the first day. The Kremlin has been the heart of Russian politics for centuries. From there, Russia’s Tsars ruled the empire. But apart from the Kremlin and countless churches and museum there’s a far more interesting (and cheaper) attraction. Moscow’s metro! Moscow metro will be your choice of transport when visiting Russia’s capital. It’s cheap, fast, clean, safe and efficient. It’s 188 stations cover 313km, pretty much every spot in Moscow. In terms of ridership, Moscow is third in the world after Tokyo and Seoul. But it’s not only a means of transport. To me, it looked like a museum or art gallery. Normally, I’m used to taking the metro in Hong Kong or China. These modern, clean, efficient means of transport are everything you wish for. Except that they are a bit boring. Very clean but there’s nothing apart from annoying advertisement everywhere. 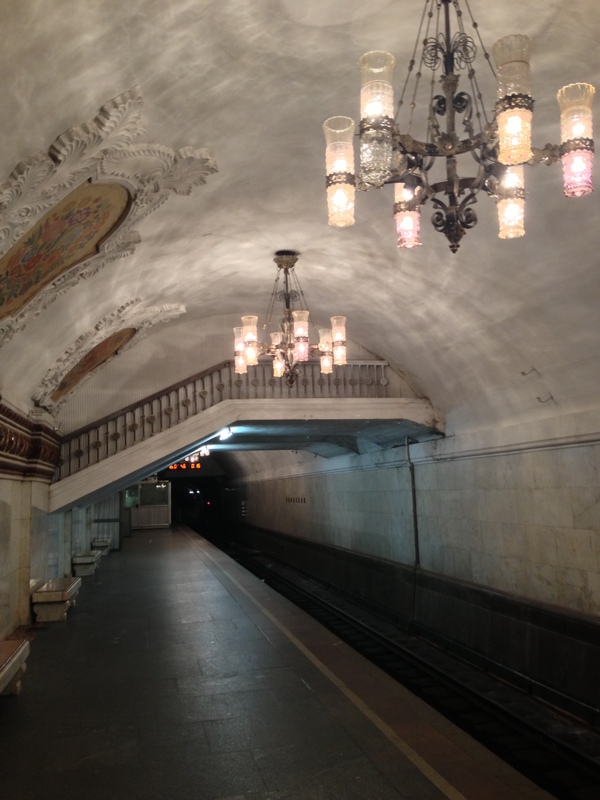 Stalin wanted the Moscow metro to be a beacon of Socialist power, a sign that Communism is providing something to the people what the Tsar’s weren’t able to. Building a metro is normally a task of engineers. And the same was true in Moscow, except that they called in the artists as soon as the engineers were done with their work. Walking into a station you see marble walls, high ceilings and chandeliers hanging from the ceiling. What you won’t see is graffiti and advertising. Wow, gorgeous. In Toronto by a museum, they have faux Egyptian, Chinese statutes, aboriginal figures. I think you would enjoy that too. At Royal Ontario Museum subway stop. I’ll check it out. Unfortunately I haven’t made it to Canada yet but it’s high on my list of things to do….